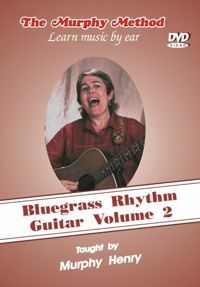 Bluegrass Rhythm Guitar Vol. 2 (formerly titled Basic Bluegrass Runs on Guitar Vol. 2): So, you’ve gotten pretty good at playing in the keys of G and C. Now it’s time to venture into the resonant keys of D, A, and E! We start you out in the key of D and introduce the A chord. We show you a variety of runs in this key and use them in a couple of songs. Then we move on to the key of A and where we present the E chord. More runs and a different song follow. The last key we explore is E, which features the awesome-sounding, but slightly awkward B-7 chord. We learn a song with more runs in this key. Then we show you the all-important “Lester Flatt G Run,” a standard feature in most bluegrass rhythm playing. Best of all, we include a long lesson on using the capo to play in different keys. If you feel like you are stuck in a rut and that all your playing sounds alike, open up new horizons with these different-sounding keys. Your singing friends will thank you! No Tab.